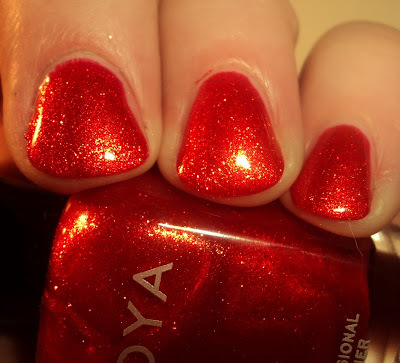 Recently, Zoya came out with 3 new summer collections. The new Mod Mattes (which I recently reviewed), Sunshine and it's (yet to be reviewed) counterpart, Summertime. Today, I have for you Sunshine, which a collection of 6 glass-flecked metallic shimmers. On all these, the finish is the same. It's a jelly-ish shimmer base with tons of golden shimmer. As this is the same on all 6 polishes, I'm simply going to list the base color in my color description. Additionally, each swatch is 3 coats, as they were a little sheer at 2 coats. Apple - bright yellow-based green. This one reminded me of green apple candy, specifically, the green apple Blow Pops I was addicted to in middle school. 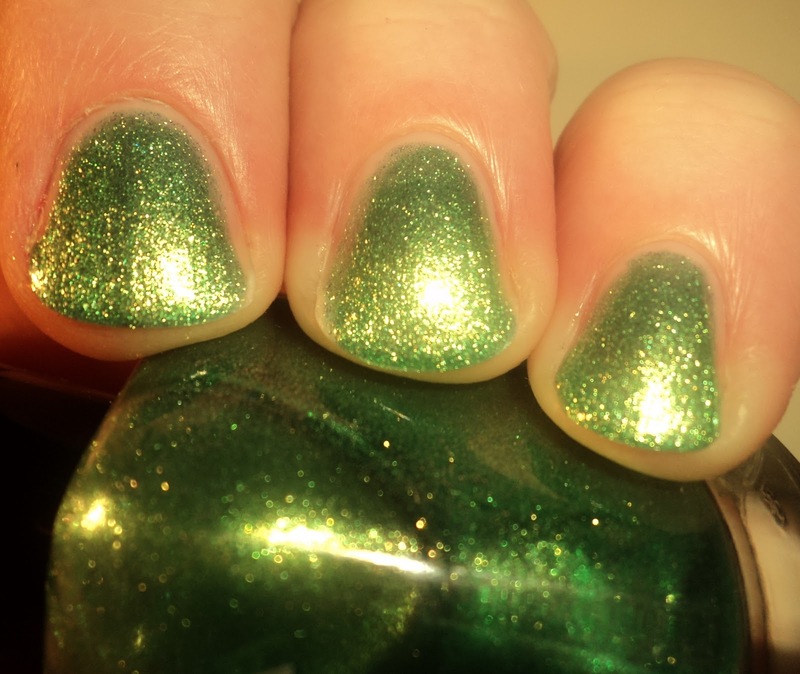 The gold shimmer in Apple looks beautiful against the bright green base. Faye - dusty browned-plum. This color is so unique. It's not purple, it's not pink, it's not brown... rather, it's a happy medium of the 3. Of the 6 polishes, this one has the brightest shimmer. I love this color and thing it would great on any skintone. Kimmy - bright orangey red. Kimmy is so beautiful. It's an orange-based red, but I really like it on my skin, and the golden shimmer compliments the base really well. I think this would look amazing with a tan. Also, this one is definitely a summer red. IMO, it's the summer version of Zoya Carrie Ann, from the fall collection. Reva - bright raspberry pink. 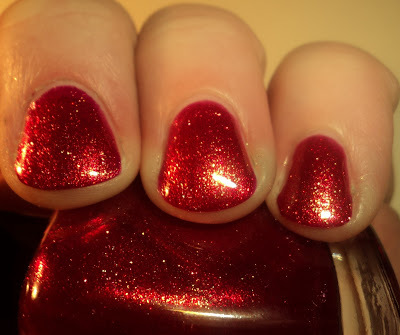 This one reminded me of ChG Raspberry Festival, though it's packed with golden shimmer (IIRC, Raspberry Festival had golden glass flake shimmer, but it was rather subtle). This puppy is far from subtle. I love this one, and I think it's probably my favorite of the collection. Rica - coppery pink. 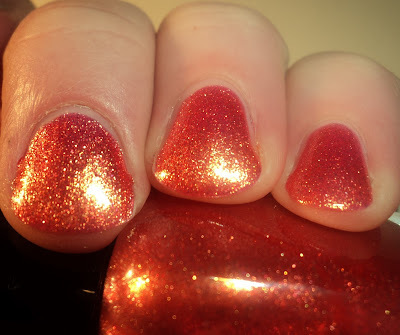 The base on this one is almost the exact shade of watermelon candy (the pink kind, not green), but it's so loaded with golden shimmer that the overall effect is a coppery pink. This is a beautiful color, but it didn't really compliment my skin. I think this would amazing on someone with a tan or with darker skin. It reminded me of ChG Strawberry Fields (another pink + gold combo that didn't like me). 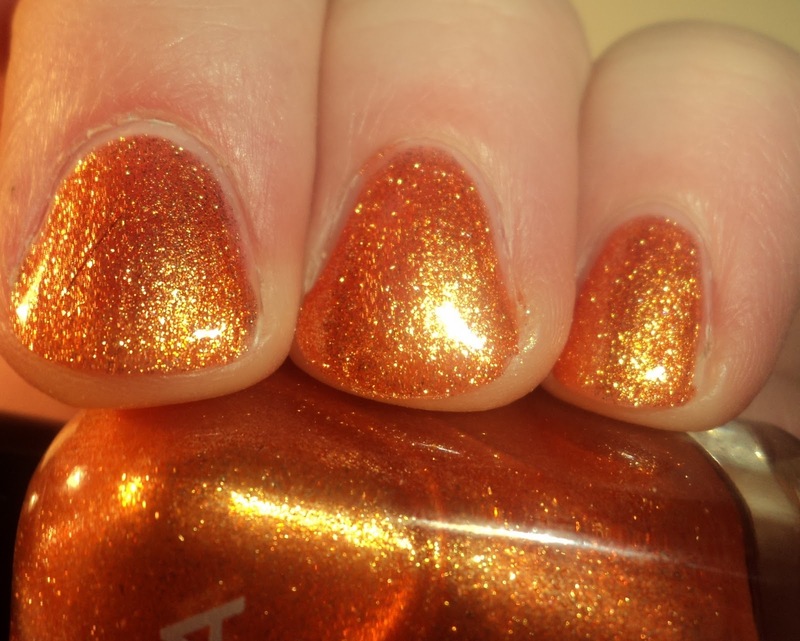 Tanzy - golden orange. Okay, I have a love/hate relationship with golds. I love them in the bottle, but dislike them on me. This one isn't an exception, and because this one was an orange as well... it was a double-whammy. It's a beautiful color... a warm, golden orange base with tons of that golden shimmer, but it just didn't play nice with my skintone. Again, it would amazing on tanned/darker skin. All in all, I like this one. 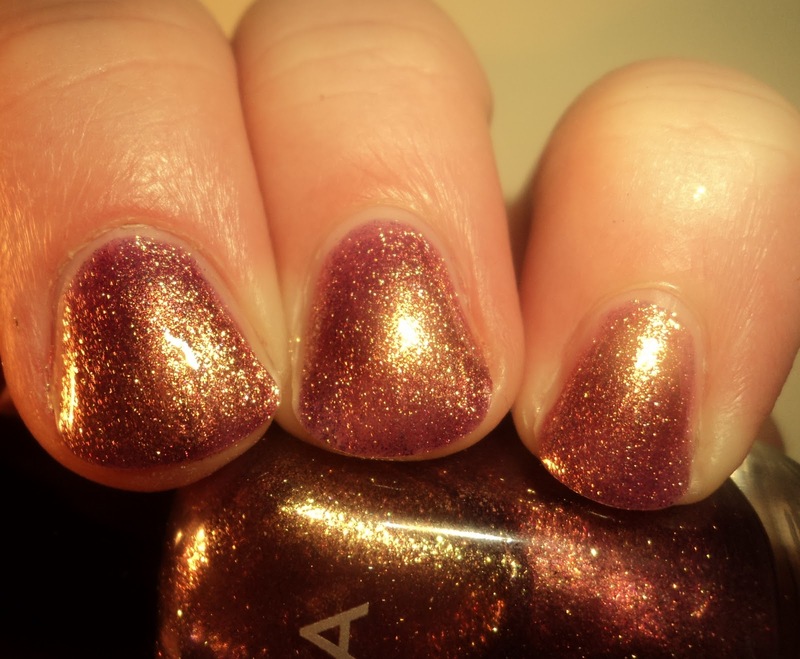 It seems like Zoya's been doing a lot of these glass flecked metallic shimmers lately. I can think of at least 4 collections with some level of this finish. That said... that is fine by me. :) They do them exceptionally well! There isn't a color I don't like, just that some of them work with my pink skin and some don't. These are now available at Zoya.com. Zoya retails for $8 a bottle. I think the only one I'm really desperate for is Faye. It's just too lovely to pass up. Confession: I don't even wear nail polish, but I read your blog every day, both because it's an enjoyable read and because it helps me pick polishes to give to my little sister, who is in residential treatment for depression and loves nail polish. So thanks for helping me choose gifts to cheer her up! I really need to buy apple!! But I also liked faye, tanzy and rica... Beautiful shimmer/glitter colors! I bought Rica, but the more I look at Kimmy the more I LOVEZ it! Very pretty. I can't wait for my order to arrive - should be here any day now. You've made me extra excited for them with this post.